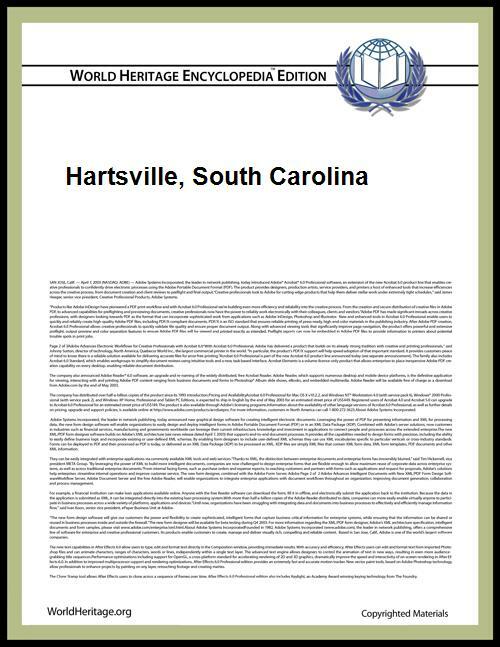 Hartsville is a city in the Pee Dee region of South Carolina and is the largest city in Darlington County. The population was 7,764 at the 2010 census. Mel Pennington is the current mayor and under his leadership, the city has flourished to become one of the fastest growing in the state of South Carolina. The city is accessible from both Interstate 95 and Interstate 20. Because of its location on these major interstate systems, Hartsville has become a recognizable stop for many tourists on their way to Myrtle Beach. Hartsville has been an All-America City since 1996 and a National Arbor Day Foundation Tree City since 1986. Hartsville is the home of Coker College as well as a branch of Florence-Darlington Technical College. It is also the site of the South Carolina Governor's School for Science and Mathematics. Hartsville has seen significant growth over the past few years with new hotels, shopping and dining establishments, and job growth. It is served by the Hartsville Regional Airport. Hartsville is home to several major corporations including Sonoco Products Company and Duke Energy Progress. Agrium Inc. maintained a Rainbow Fertilizer plant in Hartsville until it was destroyed by fire on February 14, 2011. Agrium has chosen to not rebuild in Hartsville. The area surrounding Hartsville was once home to several Native American tribes. These tribes inhabited the region until European settlers arrived. Several tribes were present, such as the Pee Dee, Catawba, Chicora, Edisto, Sane, and Chicora-Waccamaw. These tribes were ultimately wiped out due to diseases brought in by settlers. Hartsville's first true settlement began around 1760. The town is named for Captain Thomas E. Hart. Hart was described as a kind and gentle man and he eventually owned most of the land in the community. Hart was also able to start a successful mercantile business but he lost both his business and his land during the economic depression of 1837-1838. In 1845, Thomas Hart's son, John Lide Hart, purchased 495 acres of land in what is now downtown Hartsville from Colonel Law. John Hart went on to establish a carriage factory, steam-powered saw mill, grist mill, general store, and Hartsville Baptist Church. Caleb Coker purchased the carriage factory for his son James Lide Coker in 1855. James Lide Coker came to Hartsville in 1857 with plans to implement new farming methods taught to him at Harvard College. His plans were interrupted by the start of the American Civil War in which he became a Major for the confederacy while serving. He returned to Hartsville injured and only to find that his plantation was in shambles. He made plans to reconstruct his plantation and bring prosperity to the town of Hartsville. Major Coker established Welsh Neck High School which later became Coker College. He also went on to establish a seed company, oil mill, fertilizer plant, the Coker and Company General Store, a bank, and the Southern Novelty Company, now known as Sonoco Products Company. Even with his own successes in business, Coker and his family were unable to convince other business owners in the area to build a railroad spur and so they decided to build their own which became the Hartsville Railroad and was completed in 1889. The railroad would eventually come to be a part of the South Carolina Central Railroad and the Southern Novelty Company and Carolina Fiber Company merged to form Sonoco Products Company. Sonoco would eventually expand to a global scale and become a Fortune 500 company. Hartsville is located at (34.369474, -80.080783). According to the United States Census Bureau, the city has a total area of 5.0 square miles (13 km2), of which 5.0 square miles (13 km2) is land and 0.04 square miles (0.10 km2) (0.60%) is water. According to the U.S. Census Bureau, the population of Hartsville in 2010 was 7,764. As of the census of 2010, there were 7,764 people and 3,225 households residing in the city. The population density was 1356.6 people per square mile. There were 3,704 housing units. The racial makeup of the city was 51% White, 46.3% African American, 0.2% Native American, 0.8% Asian, 0.1% Pacific Islander, 1.5% Hispanic or Latino, and 1% Two or More Races. There were 3,225 households, of which 25.5% had children under the age of 18 living with them, 32.5% were married couples living together, 22.8% had a female householder with no husband present, and 41.2% were non-families. 38.2% of all households were made up of individuals and 14.6% had someone living alone who was 65 years of age or older. The average household size was 2.35 and the average family size was 3.21. In the city, the population was spread out with 24.3% under the age of 18, 9.4% from 20 to 24, 10.7% from 25 to 34, 11.6% from 35 to 44, 14.4% from 45 to 54, 6.8% from 55-59, 3.1% from 60-64, and 18.2% who were 65 years of age or older. The median age was 38 years. The population is made up of 3,640 (46.6%) Males and 4,166 (53.4%) Females. The median income for a household in the city was $39,242, and the median income for a family was $48,594. Full-time, year-round working males had a median income of $35,333 versus $30,013 for full-time, year-round working females. The per capita income for the city was $21,815. About 15.3% of families and 22.9% of the population were below the poverty line, including 37.8% of those under age 18 and 15.8% of those age 65 or over. Major employers in the area include Sonoco Products Company, Nucor Corporation, Carolina Pines Regional Medical Center, Novolex, Stingray Boats, North Industrial Machine, and Duke Energy's H. B. Robinson Nuclear Generating Station. There are many festivals, parades, and other events that residents of Hartsville look forward to each year. Hartsville has several parks within the city and continues to add more. Byerly Park - Byerly Park is a 93-acre multi-use recreational park. In addition to its 6 soccer fields, 8 softball/baseball fields, 2 football fields, 6 tennis courts, 8-lane 400 meter track and field facility, 12 horseshoe pits, 2 playgrounds, picnic area, and concession stands, Byerly Park is home to the Piratesville Splash Pad. Piratesville is one of the largest splash pads in the state of South Carolina and operates Tuesday through Sunday when Darlington County Schools are out-of-session for summer vacation. Burry Park - Burry Park is an open green space in the heart of Hartsville. It is home to the Hartsville Veterans Memorial and Veterans Walk. Burry Park also hosts Hartsville's 'Screen on the Green' which shows movies (similar to Delta Airline's Screen on the Green in Atlanta) and Main Street Hartsville's Good Living Marketplace. Centennial Park - Centennial Park was developed for the 1981 centennial of Hartville being incorporated on December 11, 1891. The park features covered sitting areas as well as a large fountain and, during Christmas, hosts a large metal-frame lit Christmas tree. Pride Park - Pride Park features a picnic shelter, playground, restrooms and an outdoor stage used for events such as the annual Gospel in the Park series. The park is built on the site of the Hartsville Graded School, the first public school for black children in Hartsville, operating from about 1900 to 1921, as well as the later Butler School, named for the Rev. Henry H. Butler, longtime principal of the school. Park signage and a South Carolina Historical Marker placed at the park also make note of the Rev. T.J. James, who began a Sunday School at the site in 1922 which grew into Mt. Pisgah Presbyterian Church. James also established the Mt. Pisgah Nursery School in the old graded school structure. James’ family donated the land to the City of Hartsville for Pride Park, which was established in 1986. The Vista - The Vista is a pedestrian corridor built along Railroad Avenue between Coker Avenue and Second Street, connecting the South Carolina Governor's School for Science and Mathematics and portions of the Coker College with downtown Hartsville. The space was redeveloped in 2009-10 by the City of Hartsville from a portion of the former Hartsville railroad yard which once connected Hartsville’s downtown with major rail lines. The green space in The Vista features a walking path, a pond, fountains and park benches. The City of Hartsville operates in the Council-Manager form of government. City Council, Hartsville’s legislative body, is made of a mayor who is elected at large, as well as six council members who are elected in single member districts, with one member elected by his/her peers as Mayor Pro-Tem. Regular meetings take place on the second Tuesday of the month. City Hall is located at 133 W. Carolina Avenue in a building previously occupied by the Bank Of America. The new city hall opened in mid-2013. It is praised by the citizens of Hartsville as a significant upgrade for the downtown area. The Main Street Hartsville program is a partnership of the City of Hartsville, the Community Foundation for a Better Hartsville, and Main Street South Carolina, a program of the National Main Street Center. The organization seeks to build a vibrant downtown in Hartsville, focusing on thriving businesses, entertainment, recreating and historic preservation. It follows the Main Street Four Point Approach of Organization, Promotion, Design and Economic Restructuring. Main Street Hartsville administers a Sign and Paint grant for local businesses. It also oversees the Hartsville Farmers Market, Start-Up Hartsville, and Hartsville for the Holidays. They hold contests periodically in which local businesses may compete. The public schools in Hartsville are governed by the Darlington County School District. For the 2014–15 school year, the district approved a fiscal budget of $74,981,758.00. The district-wide student-to-teacher ratio is about 10.5 students to every teacher and the district spends about $9,667.00 per student. Mayo High School for Math, Science, and Technology, located in Darlington, serves students from the entire county, including Hartsville. Coker College, a private baccalaureate-granting institution, is located in Hartsville. Coker College readies undergraduates for personal and professional success through a distinctive four-year program that emphasizes a practical application of the liberal arts, as well as hands-on and discussion-based learning within and beyond the classroom. Coker is ranked among the "Best Colleges" in the South by U.S. News & World Report as well as The Princeton Review. Florence-Darlington Technical College maintains a campus in Hartsville. 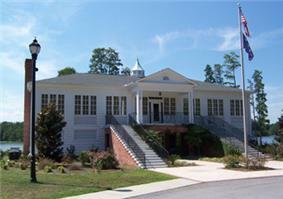 Thomas Hart Academy (grades 3K-8) is located in Hartsville but is outside of the city limits. Students from Hartsville attend other private schools in the area including Emmanuel Christian School (grades 2K-12), Robert E. Lee Academy (grades 3K-12), and Trinity Byrnes Collegiate School (grades 7-12). Hartsville is served by several local, regional, and state media outlets. The Hartsville Messenger, an affiliate of SCNow, is the local newspaper with The State serving as a source for the state. WBTW News 13 is the news channel that serves the Hartsville area as well as the Pee Dee region. Downtown Hartsville and most neighborhoods in Hartsville are designed around a standard grid layout whose use began when the city first developed. However, in newly developed sections of the city, such as around Hartsville Crossing, the road layout is less orthodox. Hartsville is also accessible by both I-95 and I-20. The City of Hartsville maintains garbage and recycling services for residents within the limits, as well as water services. Electrical services are provided by Duke Energy. Dish Network, DirecTV, and Time Warner Cable all serve television and internet needs. Carolina Pines Regional Medical Center is a large medical complex located on the edge of Hartsville. The hospital has 116 beds available for patients, not including those located in the hospital's Level III capable trauma/ER unit. ^ "Quick Facts". U.S. Census.